The brightness of the light, the shape or color of an object is passed from the eye to the brain, wherein a mental emotion or physical response is created. This response is reflected back through the eye language. Eyes speak louder than words, a unique mode of communicating non-verbal language. When there is direct ‘EYE TO EYE CONTACT” the speaker is either honest or faking honesty. And the listener is attentive. When we meet a friend after a long time ‘EYEBROWS ARE RAISED” as a gesture of greeting. 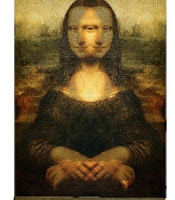 MONA LISA painting portrays uncanny ability to follow the onlooker with her subtle smile. Dutch painter Rembrandt Van Rajin is good at making the eyes of his portrait to follow the onlooker. Another interesting fact which has been observed in experiments is the fact that when we look at plants with joy, love, gratitude and admiration the plants grow faster and better. This is simply concentration, synchronization and co-ordination of body, mind and soul.. Mind and body is single unit. They cannot be separated. The mind thinks and the body acts. There is the third EYE OF WISDOM or insight with which we need to focus on good things and avoid bad events..This is spiritual wisdom.EYES NEVER LIE. Our feelings, attitude are relayed through the eyes. Our anger, hatred however deep rooted will be revealed even if we try to hide them. Thus the phrases” CASTING A EVIL’S EYE” or ‘EYE FOR EYE” is coined. “EYEING AN OPPORTUINITY “Or “EYEING ON SOMETHIG refers to our desires..
“EYE CANDY” is a pleasing sight. “EYE SORE “ is unpleasant. “FAR SIGHTED’-FORESIGHTED-NARROW VISION” –TUNNEL VISION” are phrases of our mental perception.